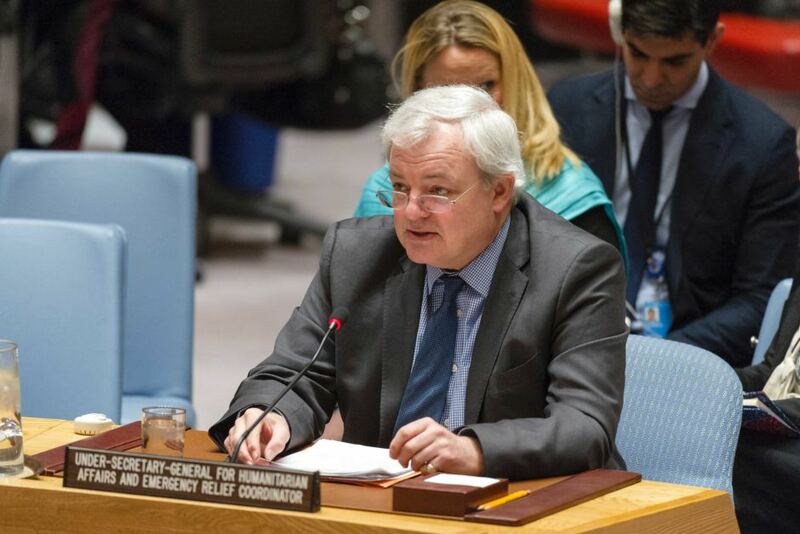 New York – United Nations Under-Secretary-General for Humanitarian Affairs and Emergency Relief Coordinator Stephen O’Brien briefed the UN Security Council on the exasperating humanitarian situation in Syria on Thursday. O’Brien’s speech focused on the deteriorating humanitarian conditions in Syria, as the conflict leaves behind more victims and displaced civilians escaping the violence. A political solution would key in alleviating the suffering of Syrians worldwide. “The Secretary-General has said time and again that there will be no military end to this conflict. Yet, military might continues to be used against civilians in a way that defies all reason, let alone morality or the law,” O’Brien told the Security Council. He said that the use of “abhorrent chemical weapons” on 4 April in Khan Shaykhun was yet another horrific account of such brutality. “The humanitarian situation is deteriorating, if that were possible, and the need for active engagement by members of the [Security] Council is urgently needed,” he said. In the same context, the British representative at the session criticized Russia’s support of Syri’sBashar al-Assad and his regime, which curbed the Council’s capacity to pressure regime forces to stop the bloodshed, and allow the delivery of humanitarian aid to civilians. Russia’s deputy described members’ remarks on regime forces curbing aid as hypothetical, pointing out that the humanitarian convoys in Syria face risks, so some pro-regime military accompanies them for protection. US Ambassador Nikki Haley urged the UN Security Council on Thursday to ratchet up pressure on Russia to end sieges in Syria and help advance peace talks. “All eyes and all pressure now need to go to Russia, because they are the ones who could stop this if they wanted to,” Haley told a council meeting on the worsening humanitarian crisis in Syria. Haley argued that years of appeals to Assad to allow aid deliveries to reach civilians in besieged areas had failed and that the focus must now squarely be on the Syrian regime’s main ally. The core needs of the Syrian people from the international community remain largely unchanged, noting that they include the protection of civilians by all parties to the conflict; immediate, unimpeded and sustained access to all in need throughout Syria; an immediate lifting of all sieges; and a political solution to the conflict. In besieged eastern Ghouta, outside Damascus, civilians remain trapped amid reports of relentless shelling, airstrikes, and ground fighting, he said, noting that the last informal access routes have reportedly been closed further restricting movement for the some 400,000 people who live in the area, and who the UN has been unable to access since October last year.